ISLAMABAD: Prime Minister Imran Khan on Wednesday vowed to steer the country out of the prevailing crisis and get the affairs in order as he cajoled the nation not to get worried and be composed. He said that such ups and downs are usually a part of nations' history. He was speaking at the launching ceremony of 'Naya Pakistan Housing Project' here at the Prime Minister's Office. 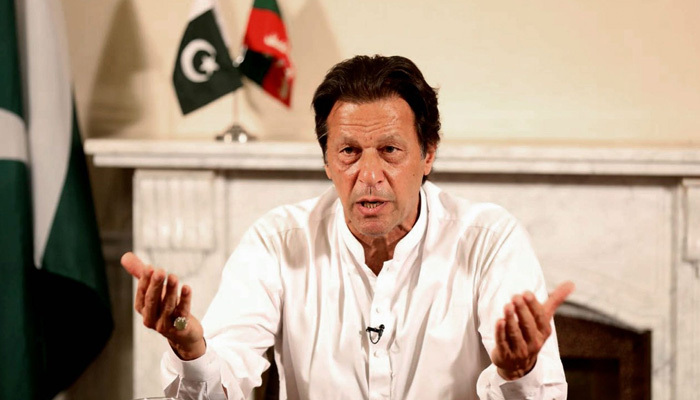 Acknowledging the public's woes in view of the recent dip in the currency and mounting debt, Imran Khan defended his government's decision to approach the International Monetary Fund (IMF) for loans. "We want loans so that we can pay off the loans," he said, adding that "had the money laundering had been prevented, then there would have been no need for loans". The prime minister maintained that he would present a roadmap before the nation listing steps the government will take to stabilise the economy. He reminded the people to have courage; there is nothing to worry about since the turbulence in the economy won't last long. Imran Khan announced that he would guide the nation on weekly basis regarding his government's economic plans. He said an impression had been created in the last 48 hours "as if the sky is going to fall (or) the day of judgment is upon us". He said the previous governments had taken loans recklessly, which has resulted in the country's debt ballooning from Rs6 trillion to Rs30 trillion in the past 10 years alone. He said the previous PML-N government had started its term with a $3 billion current account deficit, but the 40-day-old PTI government inherited an $18 billion current account deficit. He said Pakistan today faces a shortfall of $10-12 billion to pay its loans and purchase imports in the short term. He said his government had been debating seeking help from friendly countries and approaching the IMF for a bailout programme as well. The premier reiterated that the government was seeking funds from external sources only for the short term, as the economic reforms and austerity measures initiated by his government "will take six months to show results". Talking about possible recourse to bridge the deficit, Imran Khan said the total amount laundered out of Pakistan annually, according to the US State Department, is $10 billion. “So if we had curbed the money laundering in the past, we wouldn't have to pursue loans today,” he said. Imran Khan said the country also wouldn't have to knock on the Fund's door if the government managed to convince overseas Pakistanis to send $20 bn in remittances through banking channels. He pointed out that the incentives given by his government can also lead to exports rising by $10 billion from a current $20 billion. “The available options show that ours is a wealthy country. The only misfortune of this country has been lack of management,” Imran said. Giving details of the Naya Pakistan Housing Programme, he revealed that five million affordable houses will be constructed in five years targeting the low-income segments of society. He said the scheme will bring long-due prosperity in the country. He said at least 40 other industries connecting with housing will also be set in motion as soon as construction is started for the project in urban as well as rural areas. He said the target of the plan is the common man, who could not even think about owning a house. Imran said while citizens of many other countries build their houses through loans, only 0.25 per cent of Pakistani citizens take loans for the purpose due to lack of appropriate legal structures. He said the government's housing policy will seek to eliminate these hurdles. He said the construction for the scheme will be carried out by the private sector, while the government will facilitate it by removing hurdles and providing the land for the construction. In this regard, he announced the formation of the 'Naya Pakistan Housing Authority' (NPHA) that will provide one-window operations to facilitate the construction industry. The Authority will be set up in three months, while a 17-member task force will oversee the housing project until then. The premier said the government will also locate the katchi abadis across the country and regularise them. “Our target is to build five million houses in five years. The homes are to be made for the common man, who earns Rs10,000-25,000 a month,” he said. Imran said that boosting the construction industry would directly solve the country’s unemployment problem. He said the target of the government was to ensure provision of five million affordable houses for under-privileged classes during the next five years. The prime minister expressed the confidence that the programme would not only help realise the dream of a shelter for the poor but also create employment opportunities. It will also attract local and foreign investment and stimulate about 40 related industries. Imran said a National Financial Regulatory Body would be set up in two months to remove the hurdles in financing of construction of houses. He said a Land Bank would be instituted to identify land with the federal government, Housing Ministry, provincial governments and local bodies. He said the federal government was launching its first project for its employees and registration for the same would begin from tomorrow. He said the Punjab government would also launch a similar project. The prime minister explained that the government would serve as a facilitator while construction activity would be undertaken by the private sector. He said as the project would require huge manpower, training programmes would be launched to impart skills to people. He said 7,000 skills teaching institutes would be established in the country. He hoped that the Naya Pakistan Housing Programme would prove to be the flagship project of the government bringing prosperity to the country. Imran disclosed that a 60-day pilot project will be commenced today (Thursday) in coordination with the National Database and Registration Authority (Nadra) in seven districts to assess the demand and payment capacity for affordable houses. The prime minister said the government would remove obstacles to home ownership and that this would include working with the Law Ministry to draft legislation to make this possible.